Most kids love cakes, and mine are no exception. Some people often think that because of what I do my kids don’t eat the things other kids eat. The truth is most of the time they eat really healthy, but they have occasional times when we go out and I let them choose a cake. By choice, if the café offered a sugar-free one or reduced sugar cake, then I would prefer them to eat that. But in my opinion, the trouble with restricting food too much is that you inevitably crave them more. The last thing I want for my kids is them to start bingeing on unhealthy food when they get to make their own food choices. I have taken out the mystery of shop bought cakes, and funnily enough, my kids often find them too sweet now. Long may this continue. This recipe isn’t sugar-free, it has natural sugar from the banana and I have used rice malt syrup as a sweetener. This is the first time I have used rice malt syrup because I have been on the fence on whether I wanted to bake with it. However, I don’t like normal white sugar, and don’t want to use artificial sweeteners and not keen on fructose either, so I thought I would give this a go to see how it turned out and I was pleasantly surprised with the results. There are a number of similar recipes on the web and else-where for chocolate banana cakes, but this is my version. 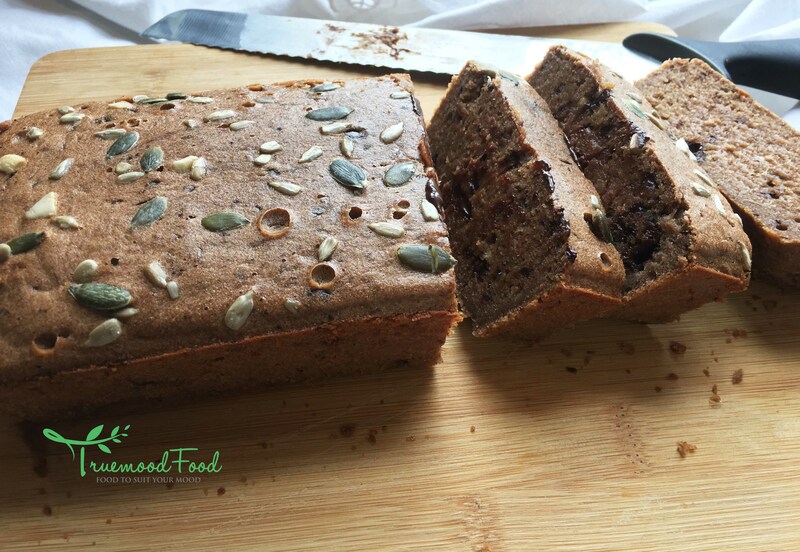 It’s ideal for hungry children back from school, packed with energy giving potassium from the banana’s and I have used spelt flour which is often kinder on the gut than normal white flour. You could, of course, use gluten free flour if you prefer. I used butter but you could use coconut oil if you don’t want to use dairy. But I haven’t experimented with this yet. I put these in my kid’s lunch bag for their snack and they loved it. It has filled the hunger gap for them before lunch but makes a great after school snack as well. It isn’t like a sponge cake and is more dense, but moist and very filling so you don’t need to eat a lot of it, unless you are really hungry of course. If you have a version of mine I would love to hear about it? Add the butter, eggs, flour, brown rice syrup cocoa powder and cinnamon into a mixing bowl. Whisk with an electric mixer. The mixture should be quite wet but don’t worry about this. Roughly chop the dark chocolate, into smallish pieces and add to the mixture, stir around gently with a wooden spoon. Grease a loaf tin, and place some grease proof paper on the bottom. Pour the mixture into the loaf tin and sprinkle the top with the seeds if desired. Put some tin foil or grease proof paper over the top for the first 20 minutes of baking, and then remove and bake in the oven for approx. 45 minutes until the sponge springs back once you touch it. This cake has just the right amount of sweetness, not too bitter and not too sweet and perfect for hungry kids or hungry mums and dads after school.